The audience at Sigma's parallel event presentation at the 63rd Commission on the Status of Women held March 2019 in New York, New York. Sigma's newest class of United Nations representatives at the 2019 Commission on the Status of Women. Sigma United Nations liaison Pennie Sessler Branden with friends from Mozambique and South Africa at the Commission on the Status of Women orientation session. Sigma United Nations youth representative Dania Al-Itani, Sigma United Nations liaison Aric Shimek, and Sigma United Nations youth representative Dawn Fitzgerald attending Sigma's Commission on the Status of Women parallel event presentation. Delta Zeta Chapter members were well represented at Sigma's Commission on the Status of Women parallel event presentation. Sigma United Nations liaison Pennie Sessler Branden and Sigma United Nations youth representative Dania Al-Itani attended the United Nations Secretary-General Townhall Meeting. In July 2012, the United Nations Economic and Social Council (ECOSOC) granted special consultative status to Sigma, which refers to expertise in the field of nursing and global health. This United Nations (UN) designation recognizes Sigma’s commitment to the charter of the UN, which seeks to achieve international cooperation toward solving humanitarian issues. Sigma's special consultative status refers to competence in the field of nursing, which extends to global health. This status allows Sigma greater privileges, access to nearly all intergovernmental processes at the UN dealing with economic and social development – including health and gender issues, sustainable development and human rights – and allows Sigma to participate on UN committees and to have a “voice” at the UN. Through this affiliation, Sigma commits to disseminate information and raise public awareness about the purposes and activities of the UN and related issues of global concern. Sigma will provide a strong nursing presence at the UN and will continue to conduct outreach around the world to help our nurse members better understand the work and aims of the UN, including the Sustainable Development Goals (SDGs). Four Sigma UN liaisons and two youth representatives represent Sigma to the United Nations Department of Public Information (DPI) and the non-governmental organization community. 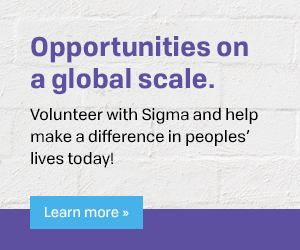 These positions promote leadership to enhance Sigma member engagement by attending and/or participating in various UN events/programs/activities with the purpose of gathering information to inform and advise the Sigma Global Initiatives department, with the ultimate goal of fulfilling Sigma’s mission. Applications for the United Nations youth representative position are now closed. Please contact global@sigmanursing.org with any questions. Applications for the volunteer United Nations liaison positions are now closed. Please contact global@sigmanursing.org with any questions.